Wanda Garner, MS, MA, is a Licensed Marriage and Family Therapist, Certified Emotionally Focused Therapist and Supervisor, Level lll Accelerated Experiential Dynamic Psychotherapy (AEDP) and AEDP for Couples therapist, workshop leader, and presenter who leads Hold Me Tight® Couples Workshops. Wanda provided counseling in her private practice for 20 years. Her specialty in her last decade of private practice was couples. Her sole focus now is helping couples improve their relationships. 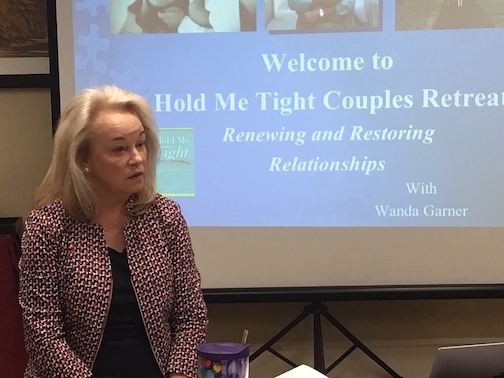 Wanda uses a proven method to lead Hold Me Tight® Couples Workshops. She offers 7 workshops each year in San Diego and the Palm Springs area. Wanda leads Hold Me Tight® Workshops for the military, Mission Strong Connection. UCSD Moores Cancer Center, NCI, invited Wanda work with their cancer patients. In 2008, she began conducting two Together Against Cancer and one Hold Me Tight® Workshops there each year. Her article, Together Against Cancer: The Quality of Your Relationship Matters, appeared in Coping with Cancer, April/May 2017. Wanda received the Outstanding Marriage and Family Therapy Award by the Alliant International University (formerly United States International University) faculty.